The Switchboard software - the implementation of the Data Description Registry Interoperability (DDRI) WG Recommendations in Research Data Alliance - now has a new capability to exchange data with the VIVO platform - open source software and an ontology for representing scholarship. Exchange of data takes place through Research Graph that enables interoperability of research data across the network of open access scholarly communication in more than 26 countries. 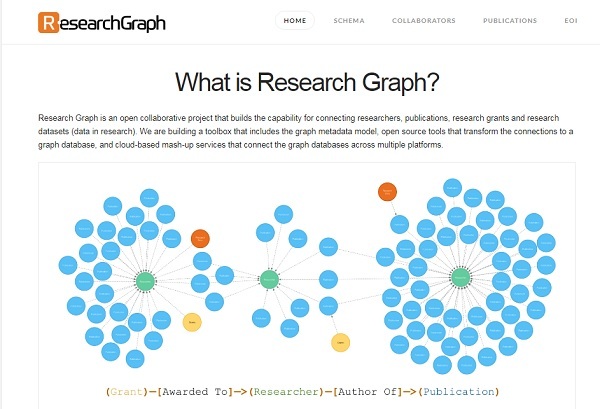 The Switchboard has enabled the DDRI partners to create a Network of scholarly works - called Research Graph - that links research data to publications, researchers, grants and other data collections across research repositories. The project enables connecting the nodes of this graph to the VIVO XML RDF records. VIVO originated at Cornell University and was developed as an open source enterprise system with funding by the US National Institutes of Health 2009-2012. Börner, K., Conlon, M., Corson-Rikert, J., Ding, Y. (eds.) VIVO: A Semantic Approach to Scholarly Networking and Discovery, Morgan-Claypool, 2012. p. 1-175. VIVO uses a collection of ontologies, including the VIVO Integrated Semantic Framework (VIVO-ISF) to represent scholarship, and it is in use at more than 150 sites in 26 countries. Open metadata regarding research outputs and scholarly activities can be assembled at the national level and made available as linked open data (LOD) using existing tools and data models. This work was presented at the Open Access Repository Conference (OR2017) in Brisbane, Australia.